Easy　A task consists from 3 sections. "Trigger" defines events which starts the task, "Action" defines what to do and "Condition" defines conditions whether the actions should be run. For example, "Trigger" is "mount of volume A", "Action" is "copy file B, C", "Condition" is "From 8:00 AM till 17:00", then if volume A is mounted, file B and C will be copied only if it's from 8:00 AM till 17:00. To set simple task like "Launch application D at 13:00" requires only 2 steps, contrary complicated task with many actions and conditions can be defined too. Various operations　Various operations can be specified with combination of "Trigger", "Action" and "Condition". Not only the time & date or repeat but mounted volume, launch or termination of application, update of file or folder, etc. can be a "Trigger". Action also can set open of app or file, shell script or AppleScript. Light-weight　Task3 doesn't use polling (check conditions of the computer over and over) to watch "Trigger" events (except CPU, network and battery observation. If those functions are off, completely polling free). It just waits appropriate notifications from various software, so it never wastes CPU power at idling time. Power management　Task3 helps you to start up the computer according to designated schedule. Task3 also can shut the computer down according to specific "trigger" like finish of download, time & date and so on. Detailed options　Task3 allows you to specify the condition to run tasks, so not only it can execute task by specific trigger event but also it can switch whether it should execute or not depends on its condition. For instance user can make Task3 launch job-related documents and applications if the computer is started up at the morning of weekday, then at the night and weekend make Task3 launch personal documents and applications. AppleScript Available　It's AppleScript available. So it's possible to run specific task by sending Email (set rule of Mail.app to run AppleScript when it receive specific titled email like "Task3 run task "run backup and shut down"). It's available to automate operations like the followings. Starts up Macintosh at midnight, connects to server and mount it, then runs back up. Downloads latest episodes of podcast in the morning and synchronizes them to the iPod / iPhone. Launches different set of start up items at weekday and weekend. 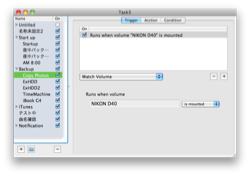 Runs back up when designated volume is mounted on Finder. Copies photos to designated folder when digital camera's flash drive is mounted. When specified application is mounted, opens related applications and files. Opens designated files and applications or runs script when hot key is pressed. When Safari finishes downloading any file, notifies it with Growl or shut down Macintosh. Opens files and application on specified day of week and time. Please refer to tutorial and other samples for more information. 05.03 v1.8.2 Fixed bug that the weekday trigger doesn’t work correctly. etc. Task3 is shareware, and costs $16 ($18 if payment is made online). You can try it for 30 days free of charge. After this trial period, Task3 shows an alert every time you launch the it. Please refer to licensing information. 14.05.03 1.8.2 Fixed bug that the weekday trigger doesn’t work correctly. Fixed bug that trigger and condition cannot change its type. 14.04.05 1.8.1 Several adjustment for MacOSX10.9. 12.12.29 1.8.0 Added temperature and fan spinning as trigger and condition. Adopted to MacOSX10.8 notification center. 12.06.16 1.7.1 Minor modification for finish of MobileMe service. 12.03.24 1.7.0 Added iCal Event Trigger. 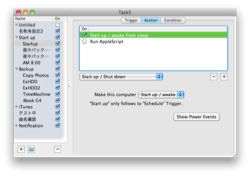 (MacOSX10.5 or higher) Task3 executes actions at start/end time of designated iCal event. Fixed bug that the app couldn't display Sync!3 backup sets correctly. 11.08.27 1.6.0 Added function to monitor CPU usage of each application as trigger and condition. 11.07.03 1.5.4 Fixed a bug that the new condition couldn't be created. 11.05.08 1.5.3 Fixed bug that v1.5.2 didn't work on PPC Mac. Fixed bug that power event schedules were not installed properly. 11.05.07 1.5.2 Improved memory management function. 10.10.23 1.5.1 Fixed some minor bugs. Calendar event condition checks existence of designated iCal event and runs actions. Added function to run Automator action directly. 10.02.23 1.4.1 Fixed bug that Task3 failed to "Save and install schedule" menu. 10.02.13 1.4.0 Added observation of mouse gesture as Triggers and Conditions. Added observation of Spaces as Triggers and Conditions. 09.12.19 1.3.0 Added observations of Battery, Network and CPU status as Triggers and Conditions. Added an action to switch task's on/off. Added a function to duplicate selected task. 09.11.21 1.2.0 Added Time Machine Trigger. Adeed function to activate/deactivate each task via Status menu item. Added function to generate running task AppleScript. Added function to activate/deactivate each task by AppleScript. Improved launch and save speed. 09.10.17 1.1.0 Added Sync!3 support. 09.09.05 1.0.1 Fixed bug that Task3 didn't handle lowercase character as hockey. Fixed bug that Task3 frizzed when Task3 menu item switch was turned off on Mac OS X 10.6. Fixed bug that observation of mount and unmount didn't work well.